Anyone who has traveled knows those days that have proven so stressful that you wonder why you put yourself through it. And they also know the sheer joy of those travel experiences that can be termed 'magical'. Today we danced with Zorba in a manner of speaking in what might be the best outing of our trip so far. 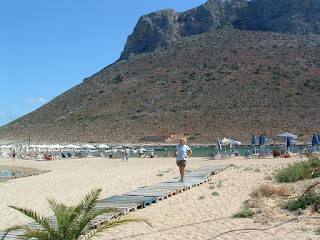 Earlier posts on this blog noted Stavros, the beach where "Zorba the Greek" was filmed as a possible novel destination. We almost skipped it in lieu of returning to the heart of Hania for our last day; are we glad we didn't. Stavros Beach, where Zorba did his famous 'sirtaki' dance is on a beautiful cove at the base of a rocky mountain (it is this mountain in the film that Zorba's ill-fated logging plan failed). There were few beach chairs set up and a single concession on the beach - in fact there isn't much in Stavros (a plus!) other than a few restaurants and beach homes. 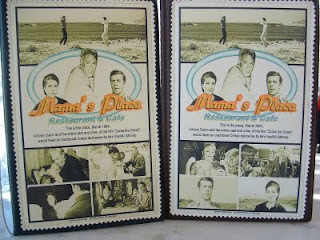 We dined at a restaurant, Mama's Place, across from the beach that had been operating since 1951. The cast and crew had dined at the Vasiliki family restaurant while filming and being unable to pronounce her first name had simply called her 'mama' and the rest is history. Petros Vasiliki was 16 at the time the movie was filmed and today he is a white-haired 61-year-old who runs the restaurant and tells tales about the days of Stavros in 1964 when the film put the place on the map. The food was excellent, the setting perfect and our visit with Petros, one of those experiences that make travel worthwhile.